Duena Blogger Template is a clean and elegant, Bootstrap powered, fully responsive theme is designed specifically for personal blogs. Even though Bootstrap templates are mostly flat, the gradient on the background creates depth effect that makes content blocks float in the air. Red and its hues prevail in the theme design giving it some warmth and passion. This template fits perfectly into all browsers of tablets, phones and PCs. 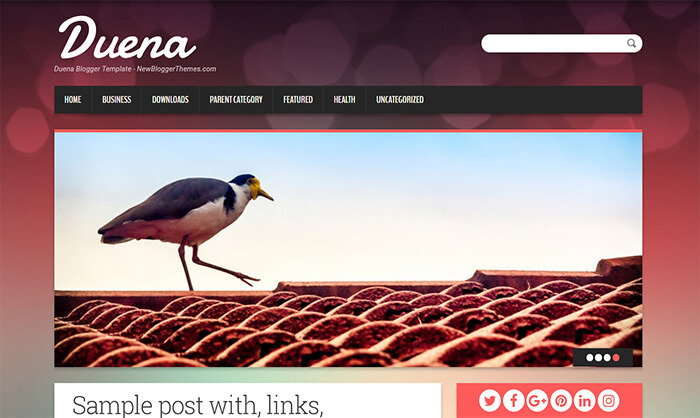 Duena blogger template has a slider, right sidebar, top navigation menu, related posts with thumbnails, social and share icons, auto post summaries, scroll-to-top button, Google web fonts and more.